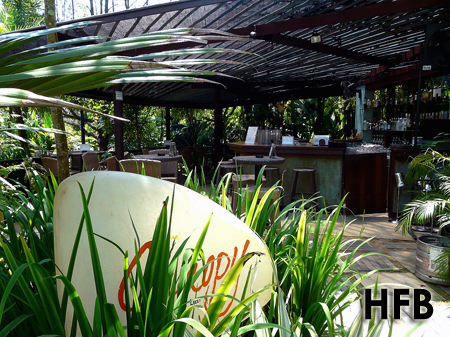 Canopy, located within lush gardens of Aramsa Spa in Bishan Park is positioned as an Australia style café that provides the perfect getaway for families, couples and pet lovers alike. The new outdoor Canopy Bar also provides a unique setting for one to lounge and enjoy a mug of beer, or glass of wine with friends and loved ones. And if you do not already know, Jazreel Low, the former Star Search 2nd runner up and her husband owns the spa and the restaurant, along with some other business partners. 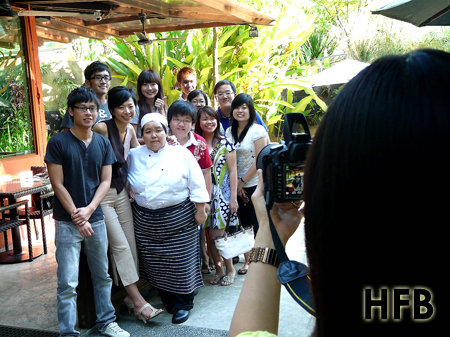 As part of the group that took part in the food tasting session for the last recording of Y.E.S. 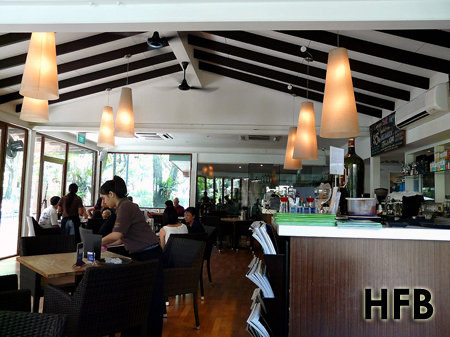 933 美食鉴定团, HFB was served first the Trio of Hot Prawns Cocktail ($16.00 for usual serving), Smoked Pepper Duck ($16.00 for usual serving) and Eggs Benedict ($12.00 for usual serving). The only thing that HFB could remember on the prawns was the accompanied Avocado and Mango, nothing memorable to say the least. 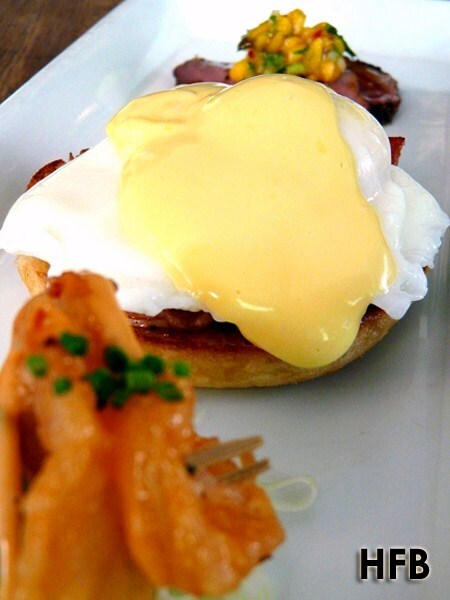 At least the eggs was decent with a runny yolk, but he did find the Hollandaise sauce slightly salty. The skin of the smoked duck was nicely seared and retained that nibble of fats, giving it a juicy bite. Next up, we were served a series of mains to share. 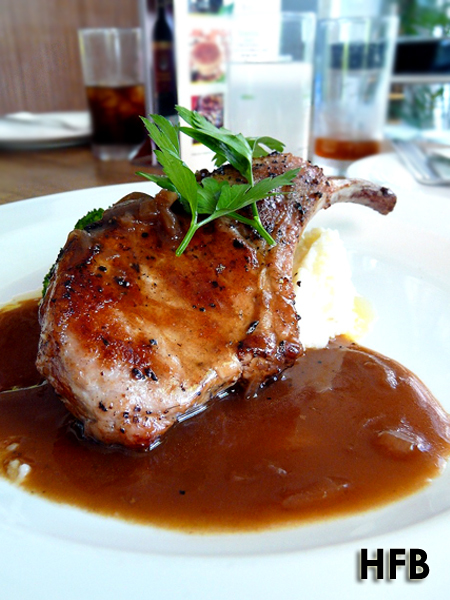 The Grilled Pork Rack ($25.00) wow HFB with its serving size. One would get a perfect thick piece of meat for a good bite. However, what would make it more awesome if Kurobuta Pork was used instead – the juicy layer of fats would definitely enhance and ensured a more luscious finish. Alas, it was not to be and HFB did find their meat a tad dry for his liking. HFB do not usually order fish for his mains (only on this instance), and the Red Snapper Fillet ($26.00) didn’t do anything that would change that. It was another decent dish that didn’t register an impression. Enough said. “Twirl it round a fork and slurp it up” – at least that’s what their menu suggest one to do it when you order their Crabmeat Aglio Olio ($19.00). 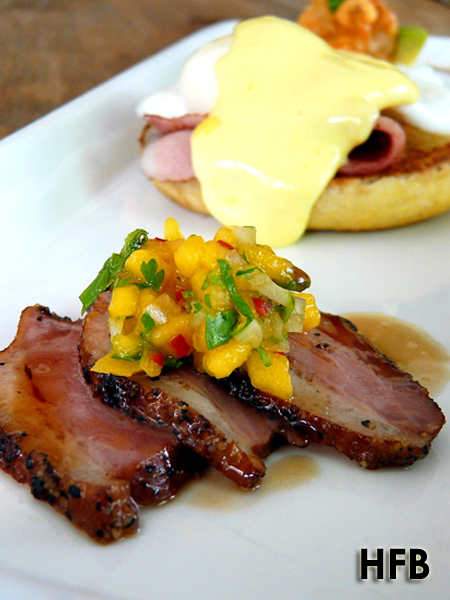 However, HFB would advise against it – this dish was clearly thumbs down for him. Close to saying it wasn’t fresh; the crabmeat didn’t have that clean, bright taste of the sea. Pasta wasn’t as al dente as he loved it to be. 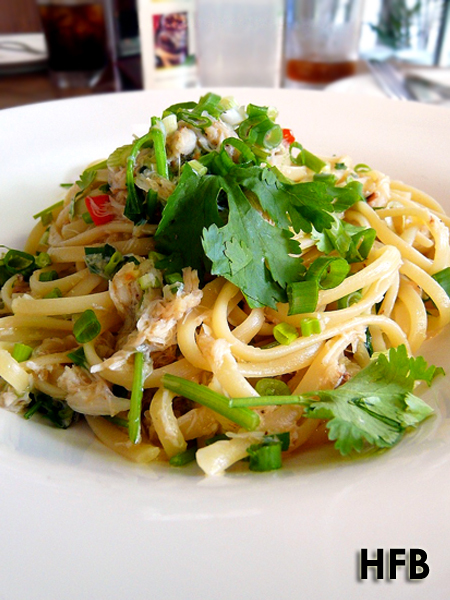 Unfortunately, HFB’s search for that elusive crabmeat pasta that can beat this version is still on-going! 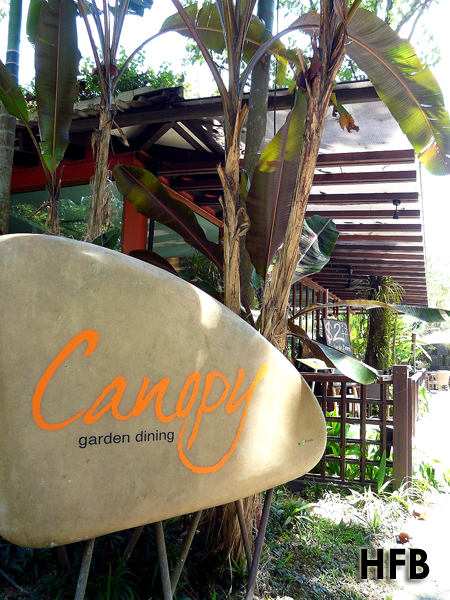 Canopy also served vegetarian menu from the Green Room Café next door, where one can also have a healthy obsession for quality ingredients with playful exuberance on their table. 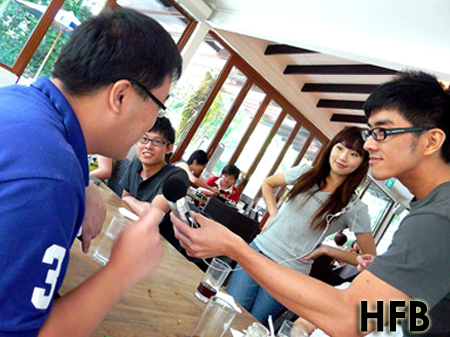 They strived to change the way one view vegetarian cuisine forever, and HFB applauded that they did. 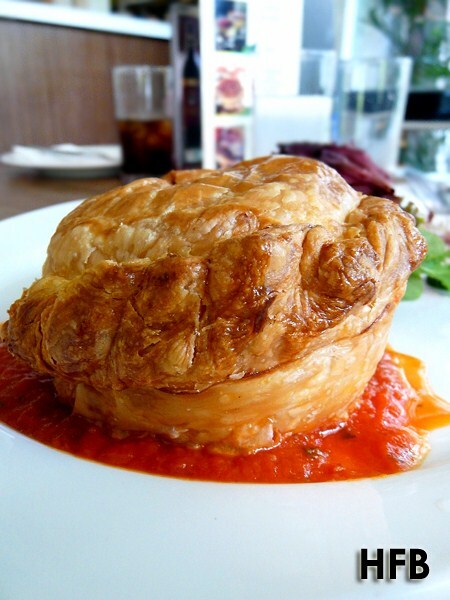 Their Curry “Lamb” Pie ($14.00) made of mushroom and carrot filling served with Vine Tomato Sauce really did tasted like lamb – so much so that one of the participants commented that it was something she never quite tasted before even though she was a vegetarian for 12 years! The curry was flavoursome and nicely spiced. Bravo! 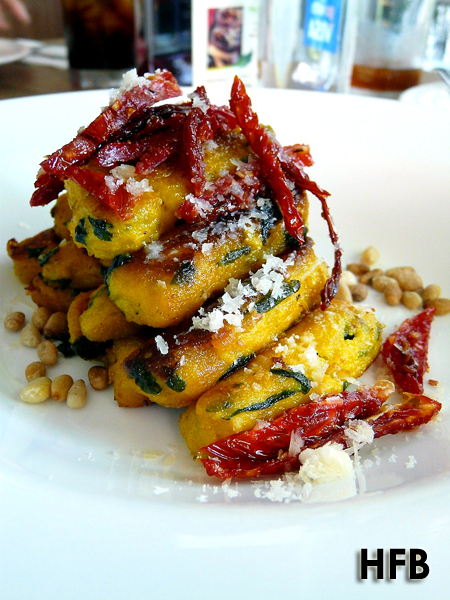 The WOW dish of the day was their Gnocchi, made of Pumpkin, Spinach served with Parmesan Cheese and Semi Dried Tomato. HFB never really liked gnocchi as the starch fills him up quickly. Usually made from ordinary wheat flour, potato, bread crumbs, or similar ingredients, their version however dominantly used pumpkin, that gives it a more sweet tasting flavour and a less starchy finished. Paired it with the semi dried tomato, and the sweet and savoury combination works harmoniously. This dish was addictive! 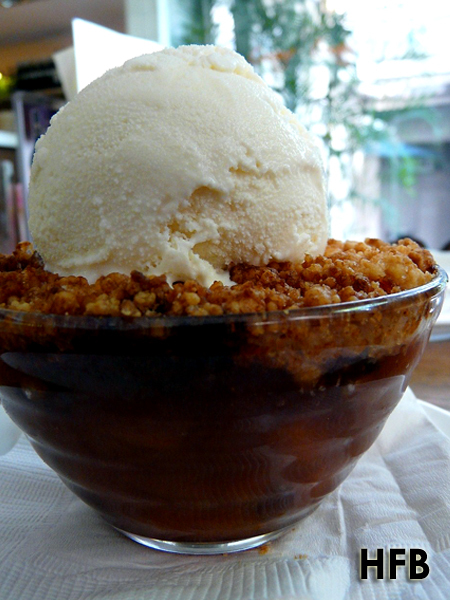 The brunch was wrapped up with desserts of Homemade Sticky Date Pudding and Old Fashion Apple Crumble ($10.00 each). 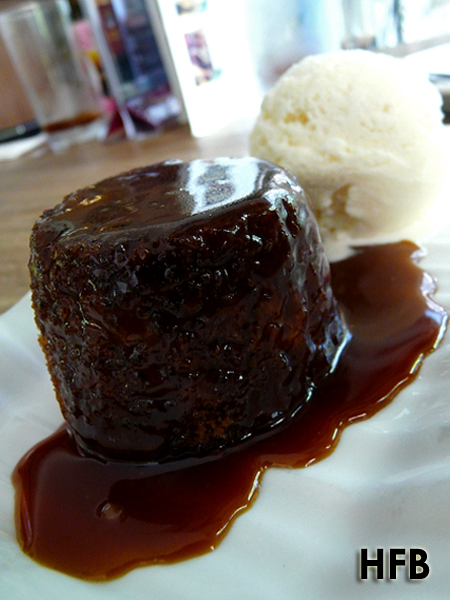 While the former tasted delightful with the butterscotch sauce and a pretty warm and moist texture, the latter paled in comparison with its slightly dry finishing and lacklustre taste. Disclaimer: No ratings would be given, as this is an invited taste test. I would also like to take this opportunity to thank Pris, Y.E.S. 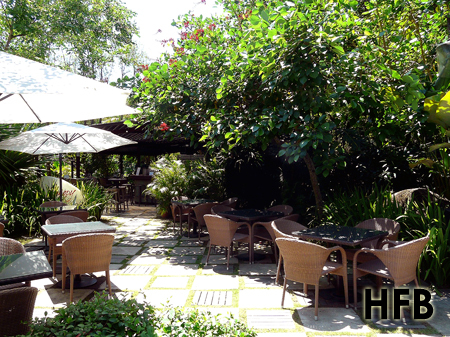 933, and Canopy Garden Dining & Bar for their hospitality. 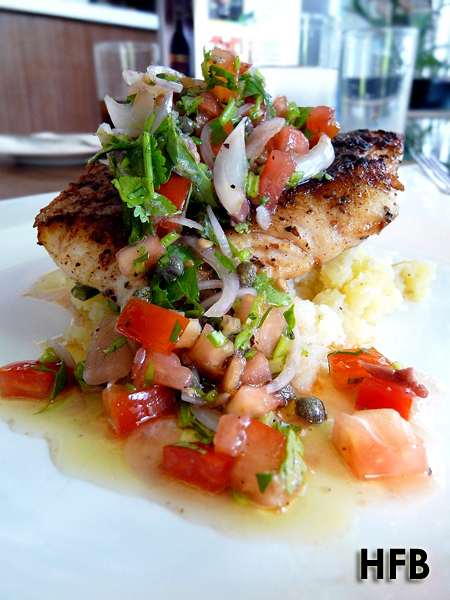 oooh, what nice food pics. great blog! that duck looks sublime. was it better than it looked? It's been awhile. And thank you for the compliments.